The curators of Experimenta Recharge 6th International Biennial of Media Arts ask three questions, only one of which intrigued: “can artists illuminate knowledge for new generations?” From computer-based animation, through DIY electronics to intensely introspective installations, the multidisciplinary DNA of the current generation of artists has been adjusting, if not exactly mutating, familiar ground. A generation has indeed passed from the time when ‘new media’ (the ‘media’ recently decoupling from the ‘new’ to re-emerge assuredly as ‘media art’) was first identified and named. Back then, while interactive constructions took tenuous shape, using the few software applications available, experimentation with the new tools often took precedence over intentions. Knowledge, as a by-product, was formalised later. Appropriately, the Recharge title of the exhibition proclaims the work is “inspired by and entangled with the past,” an historical line tempered with the invitation to celebrate the novel, the fresh, the invigorating. Experimenta’s historically successful biennial format enables the packaging of the exhibition with events and performances followed by a national touring program. Bringing together apparently “disparate technologies and disciplines,” a space exists for focused assessment on what emerges as new from within the contemporary arts. The Biennial, like several similar international media art events, stands apart from the world’s art biennales which continue exhibiting the trusty formula of object, installation, video screen and an occasional performance, but generally drawing the line at artists choosing to combine all three. 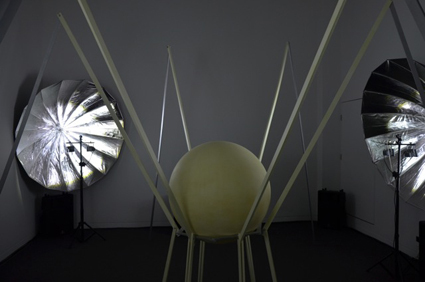 Media art shows experiment—Recharge commissioned five works—usually involving complex use of electronics. This is high-risk stuff. Ei Wada’s monumental installation, Story of Falling Records, mounts four analogue audio tape decks atop four-metre transparent bins into which the audio tape spills as an ominous rumbling is heard; then, when the bin is full, rewinds rapidly back to the spool, over the heads, revealing a catchy tune. This was “undergoing maintenance” early on in the show; clearly the risks associated with selecting such important modified-analogue works also risk losing an audience. Later by checking an elegant documentation of the piece on YouTube, I realised this as a major work. Furthermore absence of a catalogue—now available—forced me back to the web for contextual help. Is the web now confirmed as rivalling the white cube, becoming the preferred place for exhibiting media art, simultaneously storing knowledge gleaned in steady accumulations of feedback? A collective, La Société Anonyme also addresses the problem of archiving, assuring us that their “collection of binary code from sound and image media art files from the SKOR archives…is intended to last well beyond the years of present day technological systems.” We learn that black and white square structure of binary code format is “visually appealing and translatable,” made for an elegant display to one side of the main space. Knowledge invisible to the naked eye becomes a sculptural object. Three people provided curatorial input: Jonathan Parsons and Elise Routledge (both Experimenta staff) and Lubi Thomas. The 20 artists participating included seven from overseas, two of whom had completed residencies, a novel one-off innovation administered as part of the event. One of the Korinsky brothers, Abel, resident at RMIT, referenced the much discussed Big Bang reverberation using the closed ‘cube’ space of the gallery to deliver a rush of sound in (or of) the ears, the head, the body. We perambulate a construction reminiscent of solar sails, or a filled umbrella-like apparatus gathering ‘cosmic winds,’ which, when suddenly plunged into darkness, glows in the dark. In silence. Also based in Berlin, the other artist-in-residence, the Brazilian Anaisa Franco, was guest for two months in the Creativity & Cognition Studios at the University of Technology Sydney. Her three exhibits included the newly made Your Wave of Happiness, one of a ‘sensitive sculpture’ series activated into pulsing light by someone climbing onto the peak of a mound of light rope. Placed on a landing to one side of the exhibition entrance, it was one of several instances of awkward presentation in the miscellaneous spaces that make up the RMIT Gallery. 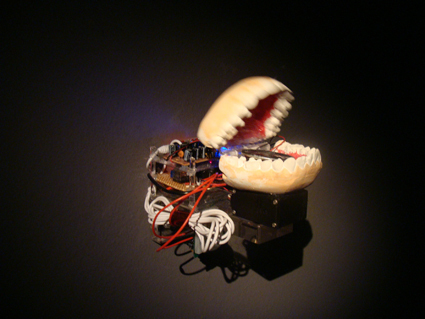 An older ‘reactive sculpture,’ Paranoia, an hilarious set of chattering false teeth activated with visible circuitry, was by contrast so much in your face as to become a navigational hazard. More often encountered in the clean spaces of the white cube, was the gloomy architecture of the gallery part of the scene-setting of ‘the past’? Stuart McFarlane and Darrin Verhagen use light in highly manipulated narrow beams over an area the size of a supermarket trolley to create staccato changing colours. This made it difficult to identify the object creating the shadows in among the pulsating light beams at the centre of this little arena. As all the exotic contenders are eliminated, it is identified as a bent paper staple; back to the 19th century. Replace clip and multiply. The disputed territories of the Middle East emerge from 100 screens in Khaled Sabsabi’s 70,000 Veils, a reference to the depths of Islamic teaching. Arranged in two large six-metre panels forming the shape of a V—or hands held out in prayer—the 70,000 images gathered on his travels are presented 700 to a screen as a single file that takes 700 seconds (about 11 minutes) to play through as successive composites. The effect is more static and reflective than this suggests as transparency levels are slow to change. A deep rumbling sound resonates and crescendos around the shared space, unavoidably it seems, layering into the other works nearby. The Experimenta Biennial of Media Arts is to be congratulated for taking the risk and maintaining the opportunity to engage with these approaches to making art, with nods toward the sciences. The illumination provided by and for the new generation reiterates the view that knowledge is like an exhibition: a construction in need of constant attention by audience, artists and curators together.